Our purpose is to make mental health an everyday conversation. We believe that talking about our feelings and our mental health is critical to addressing the mental health crisis the world is experiencing. We’re creating Pjoys as a way to have and share everyday conversations about mental health. 1 in 4 people are affected by mental illness at some point in their lives and there are 450 million people around the world currently suffering from a neurological condition. But if 1 in 4 people are affected then what about the 3 in 4? We all have mental health. We have an ambition to capture lots of conversations, ideally in our pjs, to make into beautiful, useful films that will sit on our pjoys.co.uk platform and be a resource and inspiration. We want to create more 'that's me' moments, similar to when Michelle was reading Ruby Wax's book Frazzled and realised that Ruby's description of depression was what she was feeling - that got her to her GP and the beginning of help and recovery. Hello, here are some tips on selecting rewards. If you're on your mobile, click on the rewards tab to see all the rewards available. Please note PJ sizing automatically selects XS. Scroll down a little bit more to select your preferred size on the left-hand side. please email hello@pjoys.co.uk and we can help you help us! 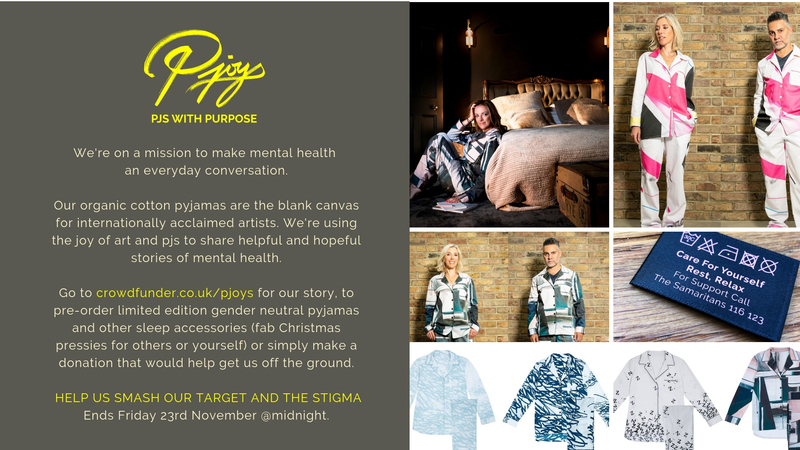 Pjoys is an exciting new purpose-led pyjama brand which aims to make mental health an everyday conversation. We want to give power to the PJ! That’s right, PJs with purpose. 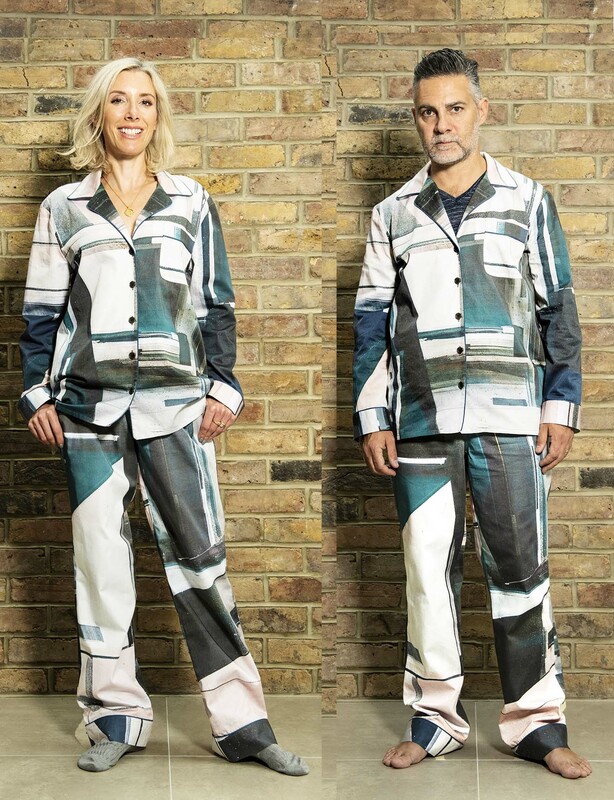 Beautiful organic cotton pyjamas are the blank canvas for internationally acclaimed artists. 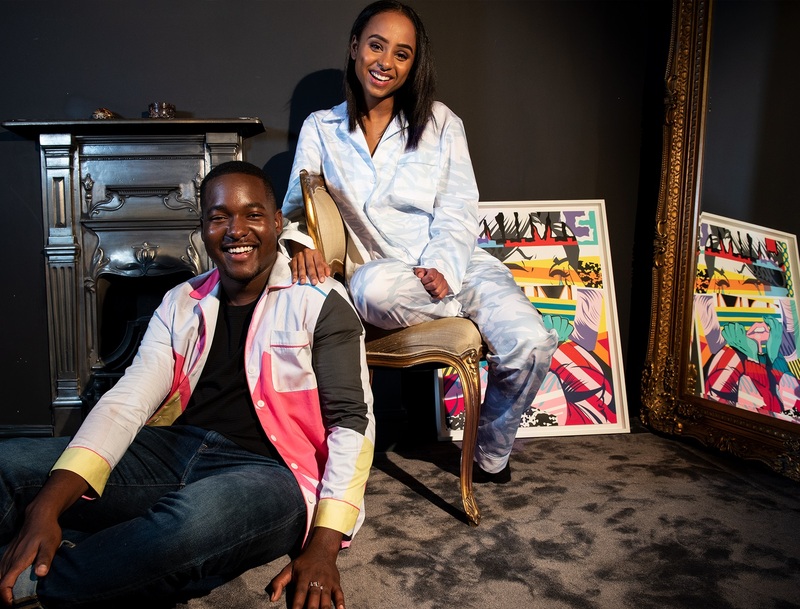 We're using the joy of art, PJs and our platform pjoys.co.uk to share helpful and hopeful stories on mental health and fund innovative projects through our foundation. Our PJs are conversation starters. 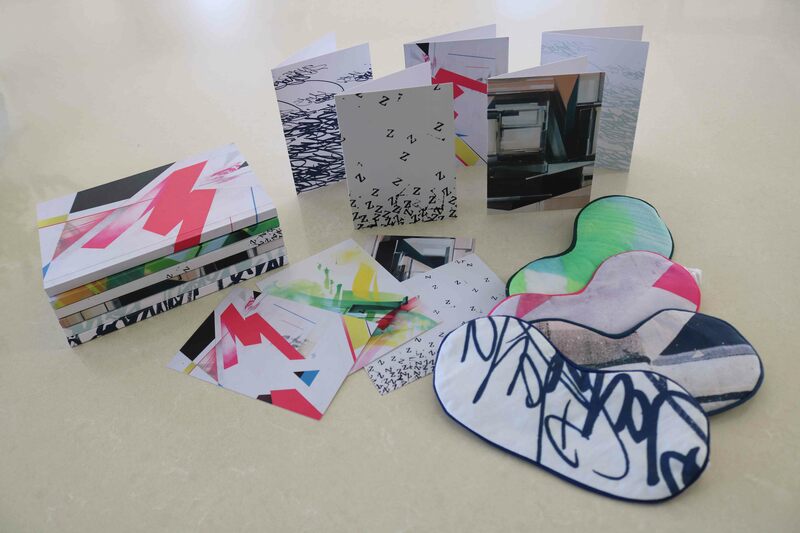 These artist designs are limited edition and will be individually numbered. Collectable, wearable art for good. Our first collection is gender neutral for her, him and they. Our PJs are packed with purpose, from what they are made from, by whom and what they stand for. Kind to people and planet. 1 in 4 people in the UK will experience a mental health problem each year. We believe talking about our feelings and our mental health is critical to addressing the mental health crisis. We ALL have mental health, how's yours today? How will it be next week? Next year? Pjoys.co.uk will become a place to share and watch conversations on mental health, as well as find the perfect PJ.  We are in the process of setting up The Pjoys Foundation through GivingWorks.org to support Mental Health charities and innovative projects who are working towards making mental health an everyday conversation. 5% of our crowdfunder total will be donated to our first beneficiary Place2Be. With the youth focus on World Mental Health Day and early intervention so important, they are perfect. Nicky Hirst is an English sculptor and installation artist. Her work explores the serendipity of objects, places or words, to look closer at the possibilities and ambiguities of language. Remi Rough for Pjoys - Sarah and Remi are both wearing a Medium. Remi Rough is a British artist, graffiti writer, designer, art director, and curator. Remi's work has exhibited in London, Paris, Perth, Tokyo, Santander, Los Angeles, Miami, Hong Kong and Perth to name a few. Augustine Kofie for Pjoys - Sarah and Remi are both wearing a Medium. Augustine has a deep interest in process and structure and creates works of intense detail centering order and tension. Active in the west Los Angeles graffiti scene since the mid-nineties. 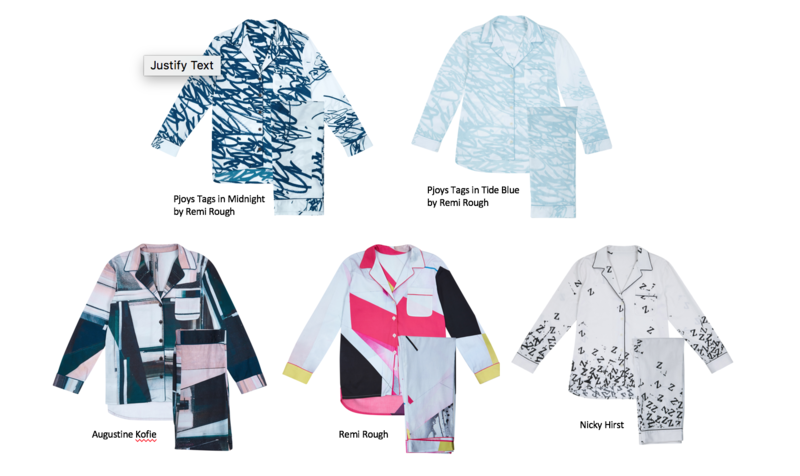 Pjoys Midnight Tags by Remi Rough - Sarah and Remi are both wearing a Medium. Pjoys Tide Blue Tags by Remi Rough - Sarah and Remi are both wearing a Medium. Offering a twist on the classic pyjama design, Pjoys guarantee style and comfort with a strong message at heart. It’s important to us to be the most kind, caring, ethical and sustainable pyjama company, so we’re packing purpose throughout our supply chain from our PJ makers to our PJ packers. The concept of Tjoys comes from the recognition that life isn’t one dimensional and it isn’t perfect. We want everyone to ‘embrace the &’ of being a beautiful real human being. Our t-shirts carry messages: Joy and Pain, Happy and Sad, Brilliant and Mad. Life isn’t black and white and we want everyone to know that it’s OK to not be OK. Embrace the & by using Tjoys t-shirts as a conversation starter. Each t-shirt is made from 100% sustainable organic cotton and has been designed by our artist in residence, Remi Rough. If you have a favourite, pick it now before it goes! Our artist designs lend themselves to beautiful items beyond PJs. Getting your thoughts out of your head and into one of our sleep journals could set you up for a better night's rest and our sleep masks are perfect for keeping the light out and the zzzz's coming. Sleep is super important for looking after your mental and physical health. 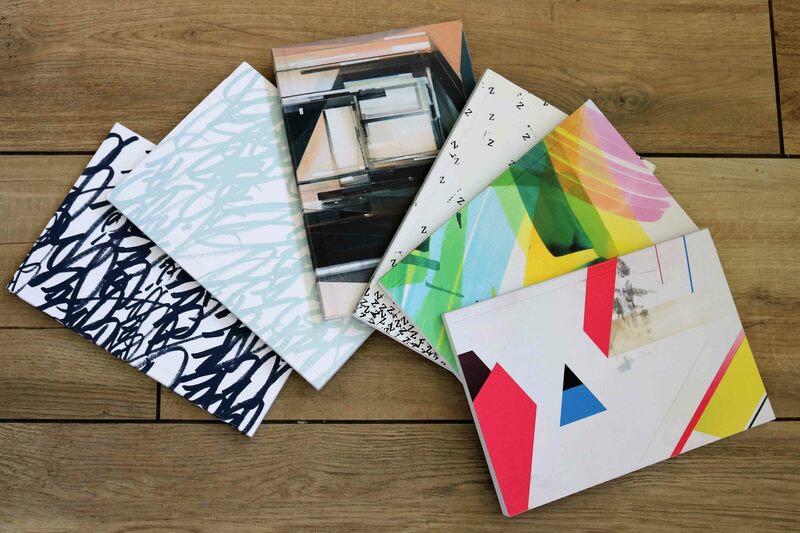 We now have a beautiful pack of 6 notelets with envelopes, available on the crowdfunder page - they are our 'Art of conversation series'. These notelets have intentionally been left blank on the inside, for you to send a personal and thoughtful message of hope, letting someone know you care. It could make all the difference to how they feel that day. 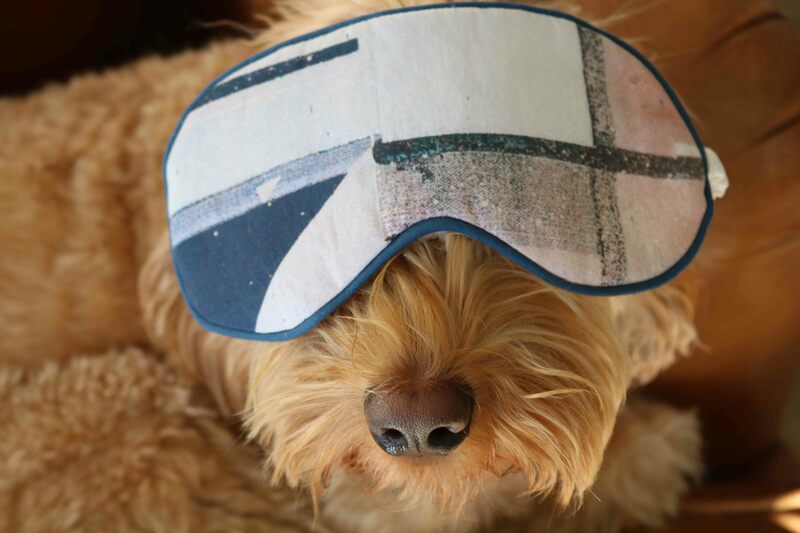 Don't forget about our lovely sleep masks, made with organic cotton and love. Thanks Monty for modelling! Getting enough sleep = good for your mental health (we think dogs are also pretty great for your mental health). PJs can offer a place of calm and relaxation, but on the flip side, they can represent an extremely difficult and hopeless time in someone’s life. We wanted to take this dual symbolism of the PJ day, together with the joy of art, to start making mental health an everyday conversation. Our luxurious two-piece pyjama sets are made of 100% sustainable cotton, with buttons made from sustainable Mother of Pearl, a protection stone, that some say brings the gentle healing power of the sea. It is a stress relieving stone; relaxing, soothing and calming to the emotions. Mother of Pearl stimulates our intuition, imagination, sensitivity and adaptability. It helps our emotions become more harmonious and balanced... No plastic here thanks. 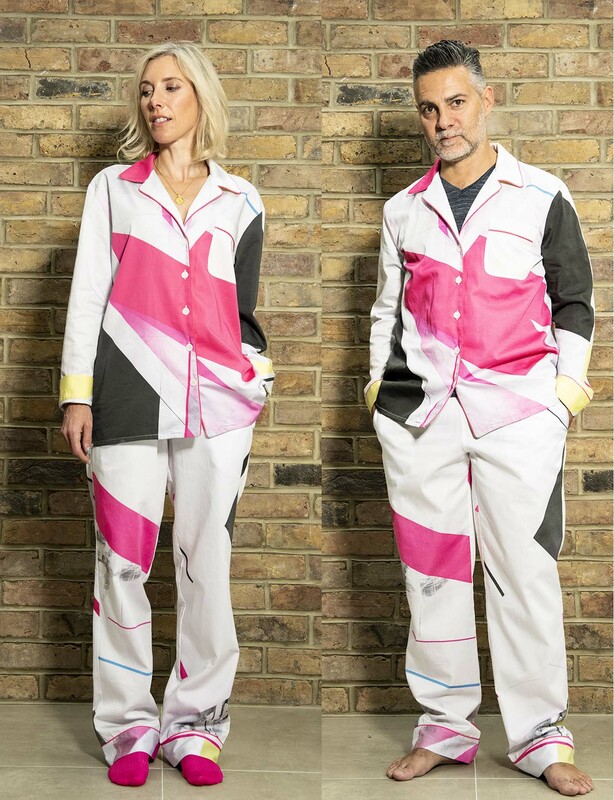 Our PJs are digitally printed to minimize the impact on the environment, designed in London and produced in Portugal. Michelle shared her Pjoys idea with her husband and artist Remi Rough, as well as friend and brand expert Susie Moore, who had also experienced mental health issues within her family. Both wanted to give Pjoys their full support and quickly became founding partners. Since then, our team is growing and each new recruit is just as passionate about Pjoys. Our goal is to get Pjoys into production and to build our platform pjoys.co.uk - which will host our PJs and also filmed and written conversations about mental health as a useful resource and inspiration. This important crowdfunder will get us started so we can invest properly in further product research, development and design as well as begin to build our pjoys.co.uk platform. If we meet our stretch target we'll also be able to get into production with our conversation content plan with our brilliant film crew who are ready to go. 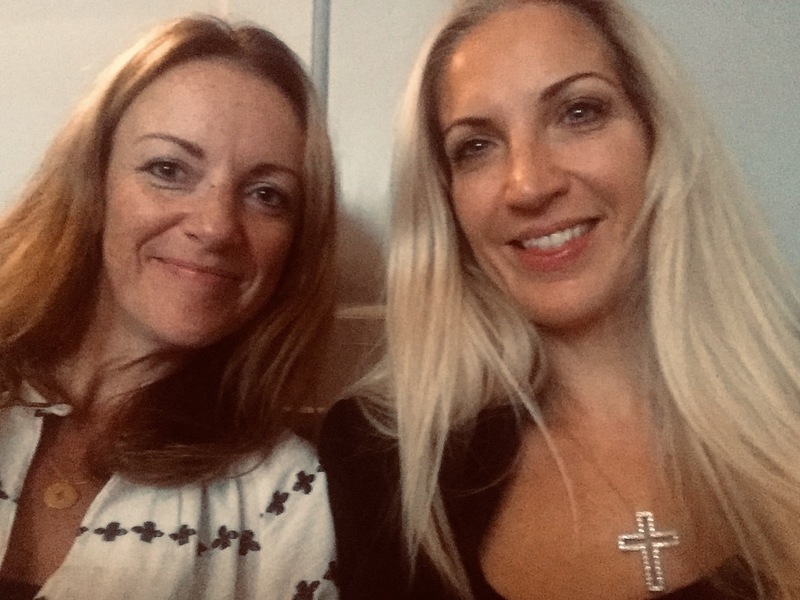 We have lots of brave and generous humans who are willing to share their stories, to create more what we call 'That's Me' moments, a bit like the one Michelle describes when she was reading Ruby Wax's book Frazzled and realised that Ruby's description of depression was what she was experiencing. It's what got her to her GP and to help. See our Comments page to read how other people have already been helped through the sharing of our mental health stories. your help will help us multiply the difference we can make . Can you help us? We need your support now! Donate or pre-order our Pjoys and help get us up and into the World! International shipping costs to be added on. UK shipping costs included. There are so many people behind the scenes who are helping Pjoys coming to life. Above and below are just a few of the amazing humans who were there on shoot day. 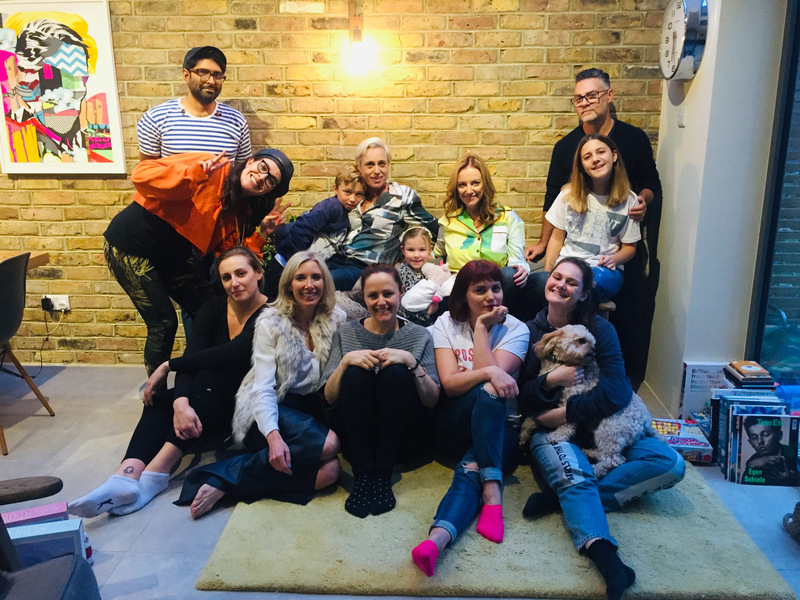 Thanks especially to Ethical Fashion Photographer, Charney Magri, Suresh Kara and Amanda May plus Jonny and the team at Cutthroat London and big thanks to Nicky Hirst, Bejay, Yara, Sarah, Lili and Freddie for joining us in pjs for the day. The power of the PJ was at play once again as we had many conversations about mental health from all kinds of different experiences. You know what? When you start talking about mental health it's not awkward, it's really quite kind and powerful. Big ups and love to the rest of the speedily expanding TeamPjoys. 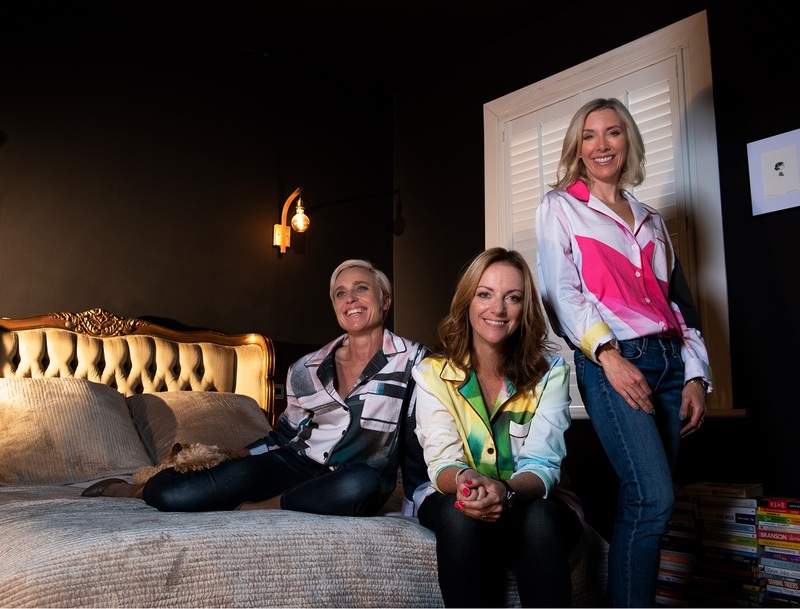 We wouldn't have the PJs were it not for our lovely designer Jo Sullivan, who's been on the journey with us from the get-go, teaching us everything about making pyjamas and so much more! Thanks Jo, we couldn't do it without you! Our production partners at Create Global have sourced our Portugal PJ production, INCLUDING ORGANIC THREAD and sustainable mother of pearl buttons (we have high standards, they are very patient). 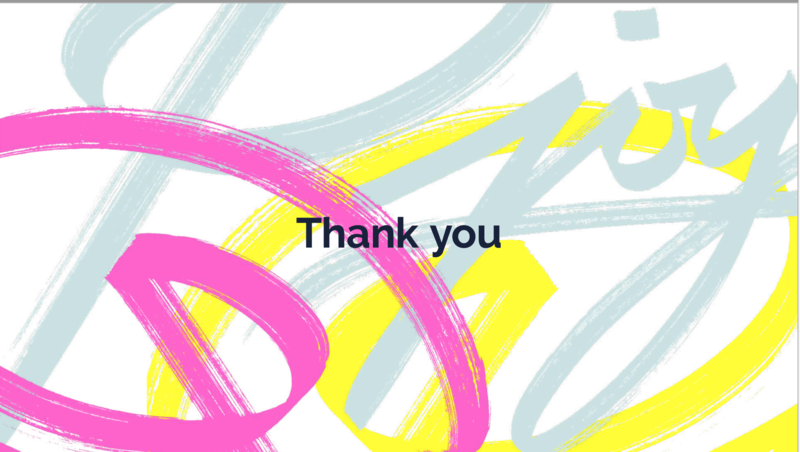 John Turner and his brilliant business RFS helped to get us off to a truly strong start with a generous pledge that we've been able to use to create more rewards and make sure their backing drives us even further. Thank you John and everyone at RFS. Also, we must give praise to the US artist Preys who designed our logo. As soon as we had the idea for our name we immediately thought of Preys, we love his style and we're proud he's part of the Pjoys story. The talented folks at SomeOne created our brand. A big idea beautifully executed. We're a bit in love with it. Big thanks and joy to Gary, KP and Lockett.